One possible interpretation of certain brain-imaging studies is that in depression, a vicious cycle becomes established among various structures of the limbic system that have become hyperactive. We already know that all of these structures are interconnected by neural pathways. 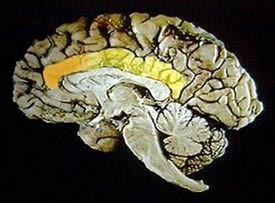 Thus someone's amygdala, which can generate a number of emotions related to fear, might produce a negative emotion, the prefrontal lobes would revive some bad memories associated with this emotion, the anterior cingulate cortex would prevent the person from thinking of anything else, and the thalamus would promote the activity of the circuits that form this “depression loop”. A substantial reduction in the number of glial cells in certain parts of the brain, such as the ventromedial prefrontal cortex, has been observed in people who are clinically depressed. This discovery is interesting, because it might explain some other observations associated with depression, such as atrophy or a decline in neural activity in certain parts of the brain. The function of certain glial cells, such as astrocytes, is to supply the neurons with energy. Hence, if the number of astrocytes decreased, a decline in the activity of the associated neurons could be expected. One of the regions of the prefrontal cortex that is most affected both by depression and by the manic phase of manic depression is the ventromedial cortex (also known as the subgenual cortex, because it sits beneath the genua, or knee, of the corpus callosum). This area deep inside the frontal lobes, on either side of the centre line separating the two hemispheres, lets us switch from one kind of affect to another. It is also heavily involved in feelings of pleasure and positive reinforcement. 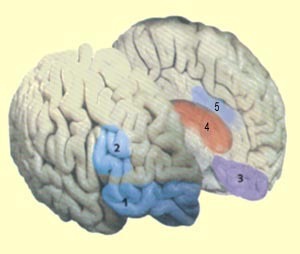 The ventromedial cortex has very dense connections with the limbic system. These connections make the ventromedial cortex an ideal structure for linking the conscious to the unconscious and for ascribing meaning to perceptions by associating them with a meaningful whole. Also, this region is strongly modulated by the neurotransmitters involved in depression. Studies of people with a family form of depression or manic depression have shown that the ventromedial cortex was up to 40% smaller in people who were clinically depressed. When researchers investigated what might be happening at the cellular level to account for this atrophy in this part of the brain, they found that it was not the number of neurons that had diminished, but rather the number of glial cells that had fallen drastically (see sidebar). Several experiments have shown that, like many other parts of the prefrontal cortex, this “emotional control centre” is nearly inactive during the depressive phase of manic depression, but becomes hyperactive during the manic phase. The logic of these two opposite states can also be observed in certain symptoms. For example, people in a manic phase find meaning in everything they do, whereas people who are depressed experience an overall loss of meaning in their lives. The cingulate cortex is another brain structure that seems to be involved in depression. This part of the cortex is very old in evolutionary terms. It lies along numerous pathways ascending from the unconscious, emotional limbic brain, as well as other pathways that descend from the conscious, prefrontal cortex and that are involved in planning actions. The cingulate cortex has been observed to be less active in people who are depressed and hyperactive in people who are manic. But the anterior portion of the cingulate cortex, unlike the rest of this structure, becomes more active during depression. Though the functions of the anterior cingulate cortex (or gyrus) are highly complex, it seems to act somewhat like an interface between the lower, more instinctive parts of the brain and the more rational circuits of the neocortex. In healthy people, the activation of this structure would thus help to focus attention on certain phenomena, often arising from our own bodies, such as pain, or the negative feelings associated with depression. Norepinephrine plays a role in the functioning of the body's alarm system, through the sympathetic nervous system and the hypothalamic-pituitary-adrenal (HPA) axis. But norepinephrine's exact role in depression remains ambiguous. On the one hand, a decline in the activity of the serotonergic or norepinephrinergic circuits appears to favour the onset of a depressive state. But on the other hand, some studies report the opposite: hyperactivity in the norepinephrinergic system during depression. Autopsies have shown, however, that patients who had experienced multiple depressive episodes had fewer norepinephrinergic neurons. A large part of the problem may therefore be the ability or inability of the norepinephrinergic system to respond properly to the demands of stress. As research increasingly shows, negative experiences with parental care in early life have an important impact on an individual's ability to manage stress as an adult. These experiences might have persistent effects on several systems, including the norepinephrinergic system.